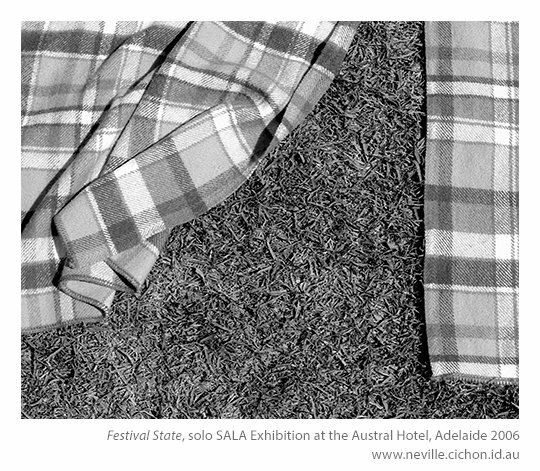 A solo exhibition during the South Australian Living Artists (SALA) Festival. 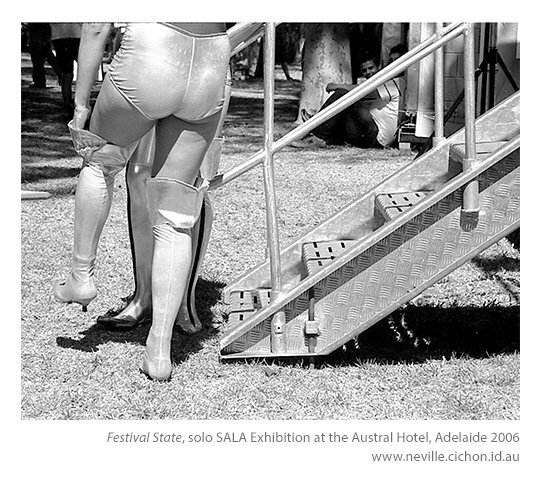 We gather in the parks and streets at arts, music and sports festivals. 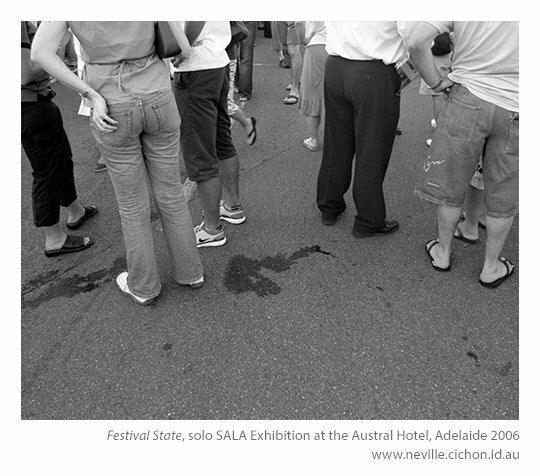 The people and the temporary landscape were depicted in black and white photographs. 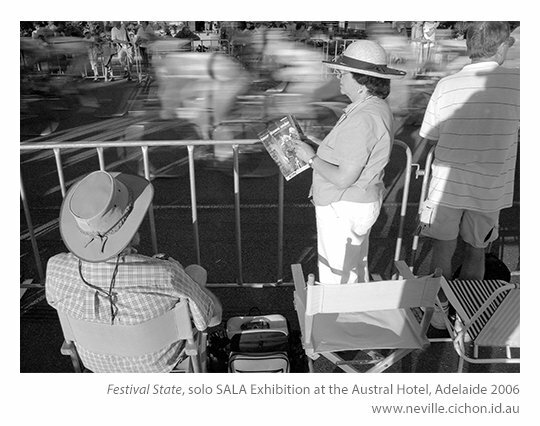 Incorporating photographs taken at the Tour Down Under, Adelaide Fringe Festival , Adelaide Festival of Arts, Womadelaide and V8 Supercars. A SALA Festival exhibition. At the Clipsal 500 event in the east parklands. Looking like something out of a sic-fi film from the 60’s, two Clipsal promotional staff had just descended from their exhibition display. At the Tour Down Under twilight cycling race around Rymill Park. 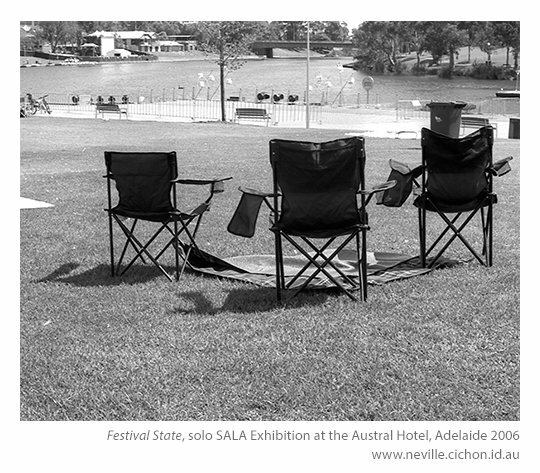 Reserving a patch of grass in Elder Park for the Adelaide Festival. I have overheard someone commenting on this photograph describing how it reminded her of her marriage. She was neat and he was messy. Reserving a prime spot in Elder Park 8 hours prior to watching Dancing Sky for the opening of the Adelaide Festival of Arts. 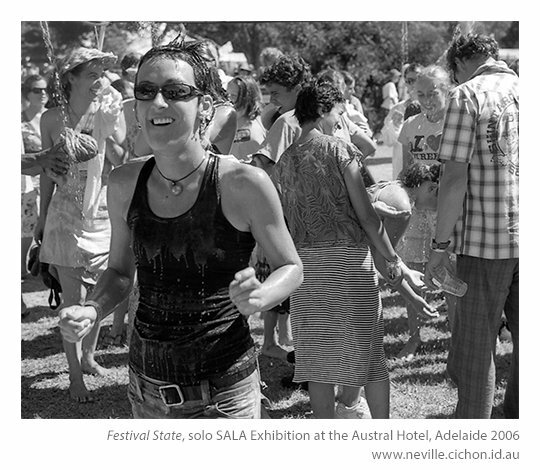 Drinking and milling on East Terrace, near Rundle Street during the Adelaide Fringe Festival. 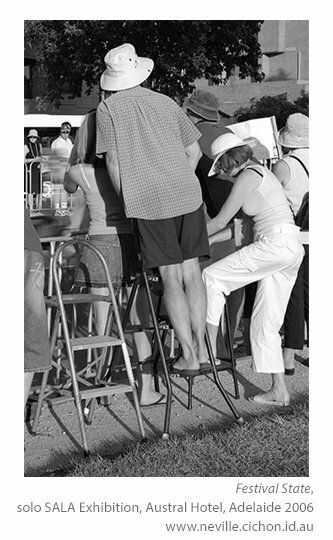 Getting a good view of the Tour Down Under twilight race around Rymill Park. After the race I saw these people walking a long way down Hackney Road with these step ladders.